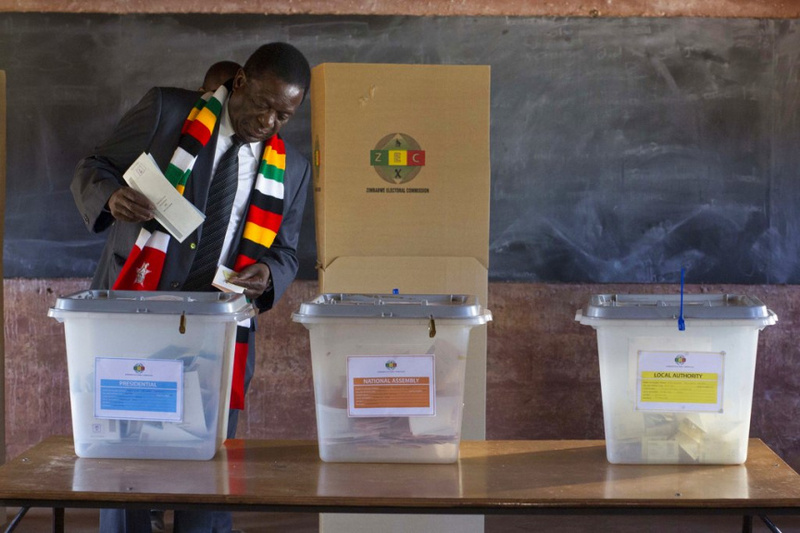 HARARE, Zimbabwe (AP) — Zimbabwe's main opposition leader on Monday said reported voting delays were a "deliberate attempt" to undermine his supporters in the country's first election without former leader Robert Mugabe on the ballot. The allegations by Nelson Chamisa, leader of the Movement for Democratic Change party, intensified concerns about management of the election and the prospect of a dispute over its outcome. The voting turnout was high and, in a break from the past, peaceful. President Emmerson Mnangagwa, a former deputy president, has promised a credible vote that he hopes will bring international legitimacy and investment to this southern African country, though a seriously flawed process could signal more stagnation. Mugabe, 94, ruled Zimbabwe from independence in 1980 until his resignation in November under military pressure and many people are anxious for change. The opposition was concerned about delays at polling stations in urban areas, where support for the opposition has traditionally been strong, while the ruling ZANU-PF party has dominated many rural areas in past elections marred by violence and irregularities. "There seems to be a deliberate attempt to suppress and frustrate" urban voters through "unnecessary delays," Chamisa said on Twitter. He acknowledged that there was a "good turnout." Long lines formed outside many polling stations in Harare, the capital, and elsewhere. Anyone in line as of the 7 p.m. closing time could still vote, though opposition parties were concerned that their supporters could drift away if forced to wait for hours. Some observers welcomed Zimbabwe's freer political environment but cited worries about bias in state media, a lack of transparency in ballot printing and reports of intimidation by pro-government traditional leaders who are supposed to stay neutral. "We need peace and we need everyone to be comfortable to go out and exercise their right to vote without fear," said Priscilla Chigumba, a judge who chairs the commission. She said she was confident that voting at most of the country's nearly 11,000 polling stations would be completed by closing time. A record of more than 20 presidential candidates and nearly 130 political parties were participating. If no presidential candidate wins 50 percent of the vote, a runoff will be held Sept. 8. "I want to do this and get on with my business. I am not leaving anything to chance. This is my future," said Emerina Akenda, a first-time voter. The main contenders were the 75-year-old Mnangagwa, who took over after Mugabe stepped down, and 40-year-old Chamisa, a lawyer and pastor who became head of the main opposition party a few months ago after the death of its leader, Morgan Tsvangirai. After voting in the central city of Kwekwe, where bystanders were silent and grim-faced, Mnangagwa said he was committed to a Zimbabwe in which people have the "freedom to express their views, negative or positive." Piercing whistles and cheers greeted Chamisa as he voted outside Harare. He said he hoped voting in rural areas would be fair. Despite Mugabe's troubled legacy, dozens of cheering Zimbabweans gathered outside the polling station in the capital where he voted. Struggling to walk, Mugabe raised his fist to acknowledge them. He had his finger inked and was assisted by his wife into the booth. Mugabe on Sunday said Chamisa was the only viable candidate and rejected Mnangagwa and the ruling party, saying: "I cannot vote for those who have tormented me." Chigumba, the electoral commission chief, said police had been informed about two presidential candidates who might have violated the law by campaigning after the cutoff time. She didn't name them, but they likely were Chamisa and Mnangagwa. Both issued public statements on Sunday. Even though Monday was a public holiday, some government offices were open so that those who had lost identity cards could get replacements and then cast their ballots. "We need change because we have suffered a lot here," said 65-year-old Mable Mafaro while voting in Harare. "We have suffered a lot. That's all."